American poet, essayist, journalist, and humanist. "Manly health and training, with off-hand hints toward their conditions", under pen name Mose Velsor, New York Atlas, Vol 21, no 17, September 1858 (reprinted in Walt Whitman Quarterly Review, Vol 33, nos 3/4, Spring 2016). "This Is What You Shall Do"
"With Husky-Haughty Lips, O Sea!" 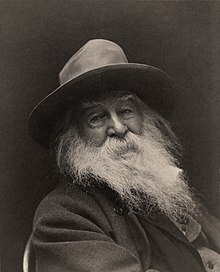 "In Cabin’d Ships at Sea"
"I hear it was Charged against Me"
"On the Beach at Night"
Unlaunch'd Voices: An Evening with Walt Whitman (1998) – Copyrighted in the United States until 2094 Keamy, Michael Z. A Play. Behemoth Media. Sincere Flattery of W. W. (Americanus) by J.K.S.